We are always trying to offer the best of what white water rafting Cusco Peru has to offer. Machu Picchu raftingr take place in the Urubamba River (Alto Urubamba), located in the rain forest near Machu Picchu and offers one of Peru’s best day rafting trips during the dry season. The Machu Picchu rafting has one of the highest concentrations of navigable whitewater sections in Cusco during the dry season. This River offers something for everyone. We been the first company to star running commercial trips down to this section becoming very popular introductory for beginners, families and school groups, besides it satisfies experience boaters with its various Level III and IV rapids. 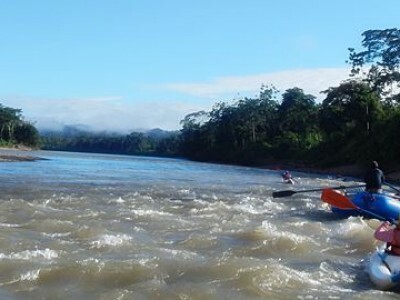 This river has different choices of trip options near Machu Picchu, and is divided into 3 sections, Santa Rosa – Chaullay, Santa Maria – Maranura and Maranura – Quillabamba. All of them are unique and satisfying. The Machu Picchu rafting its open from May to December. 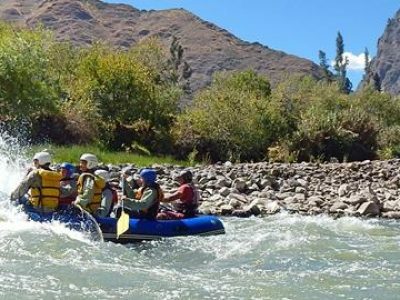 Depending your location, your white water adventure begins when you meet your guide and our private van that will take us for a drive to the Urubamba River put-in site. Before jumping into the water, the head guide will talk and demonstrate the different techniques of paddle strokes and commands, how to stay in the raft, what to do in case someone fall out of the boat, swimming position, how to hold on to the kayak, the secure ropes and the boat. 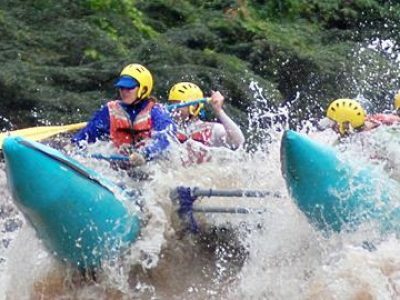 We will enjoy practicing what we learned before running the rapids and only once every member of the trip is ready and feel comfortable with all the commands and instructions, the white water Cusco – Machu Picchu rain forest adventure will begins. White water rafting Cusco practical info. This section starts in the depths of the small forested gorge call Santa Rosa the end of Santa Teresa gorge. This section offer nice views of the walls of more than 1500 meters – 4921 ft deep. Only few minutes after warming up, we will be facing one of the biggest and longest rapids on the River. The excitement of the white water keeps you awake as we descend through several rapids level III and IV. In between the rapids the rivers mellows to a quite float where you might choose to go for a swim. Through the whole rafting, your river guide will frequently check to make sure everyone feels happy and is enjoying the tour. This section is perfect for school groups and people looking for a quite adventure day. The first two hours, we will be running nice rapids with standing waves and until we arrive to Chaullay. In the beginning, the river is separated in 2 different channels, some of which are level II and III . We stop for lunch between 12: 30 and 13:00, after which we can rest or have a little nap. 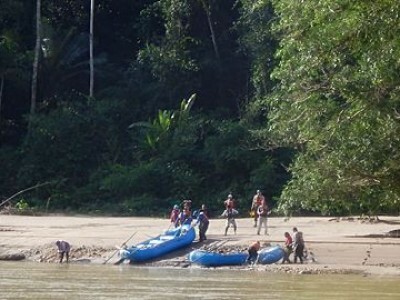 Rapids level III and III+ are to come until we arrive to Maranura the end of the trip. Perfect for families and people looking for a nice day on the river. The rives goes through different channels, we can choose level II or level III according to the level of the group. There will be a lot of time to enjoy the scenery, swim in the water and have the chance to enjoy the one person inflatable kayaks. Travel time from Santa Maria back to Cusco is about 4 hours 30 minutes. Lunch, snacks, boat, guide, safety kayak or safety cataract, life jacket, wet suit, helmet, paddle-jacket, paddle and transport back to Cusco. Train tickets from Cusco to Santa Teresa or from Machu Picchu to Santa Teresa, all of which can be arranged at the office. For more details, email contact@riverexplorers.com. Long trousers, shorts, fleece, t-shirts, bathing suit, sandals or tennis shoes (need to cover and support the whole foot), personal items, sun block, insect repellent. Daily departures. We offer departures at any time from 8 to 11 am for private groups.